As part of the renewed determination to resolve the ongoing industrial action by the Academic Staff Union of Universities in Nasarawa State University, the institution's Governing Council is set to meet on Monday 23 May, 2016, a source told NSUK Guide/CampusWatch. The source who is a member of the Council, sort anonymity because he is not authorized to speak to the press. He said "the main issue for discussion at the meeting will be the ongoing ASUU strike". This cheering news is coming after ASUU failed to suspend the strike at their last Tuesday's congress meeting, citing failure of government to reach out to them. This medium learned that the Chairman of the Governing Council Bishop Mathew Hassan Kukah was reluctant to convene Council meeting as he was not happy with ASUU. The Chairman we were told felt Council has made a generous offer to ASUU, and therefore cannot be stampeded into calling for emergency Council meeting because of ASUU's stubbornness. 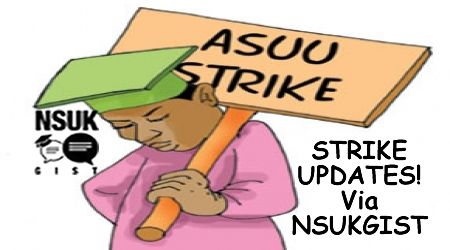 NSUK Guide/CampusWatch cannot confirm the rumour that Council maybe tabling a new offer to ASUU at the meeting. A top management staff and member of Council revealed that some Council members have proposed a 20 percent raise, to the state government, from the earlier 15 percent of the outstanding 40 percent of the Earned Academic Allowance. It is left to be seen if the new offer, if true, will make ASUU suspend the strike. It is also possible that government may go all out to clear the balance, as ASUU has insisted that the remaining 40 percent of the EAA must be paid in full. With this development it seems the Council has bowed to pressure from several quarters, including student leaders, who had launched relentless series of consultation with eminent stakeholders to see that the strike is called off soon. Students are hoping that this latest effort will yield the desired result. Feelers from the students have it that many of them are already poised for what one of them described as "mother of all protests" that will cripple activities at Lafia, the state capital, if nothing is done urgently to end the strike. The students are enraged that ASUU and government are taking them for granted having allowed the strike to last this long. Every one of students who spoke to this medium, voiced his support for a mass action that will force the state government to do something about the strike. "These people do not value our future. "Can't you see how they are unserious about the whole strike issue? ", queried one of students who doesn't want his name mentioned. "The only option left for the students is to let them know how we feel and that is by shutting down Government House and the state House of Assembly", another furious student yelled. If Monday's Council meeting yields positive result, it maybe the needed remedy to scuttle the plan of the students, and that is if it is not already late because we don't know if the plan is already afoot as I write this. The meeting is scheduled to take place on Monday; anything can happen in between now and then. But we appeal to the students to shelve their plan and await the outcome of the Council meeting on Monday. Dialogue is always the best option. Make God help us, meeting to today meeting tomorrow. when den won do all this rubbish finish.